JUST ANNOUNCED: 104-5 The Zone’s 10th Annual SportsFest featuring the Music City Blitz is March 30th at Nissan Stadium! CELEBRATE ALL THINGS SPORTS AT SPORTSFEST! WHAT: Celebrate All Things Sports and Family Fun at 104-5 The Zone’s 10th Annual SportsFest featuring the Music City Blitz! 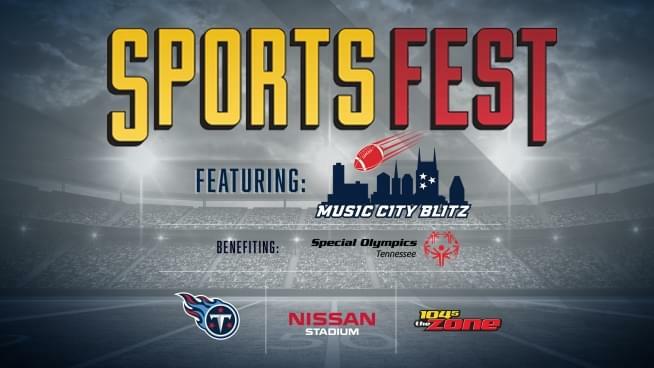 DETAILS: Celebrate all things sports at 104-5 The Zone’s 10th Annual SportsFest featuring the Music City Blitz on Saturday, March 30th at Nissan Stadium! Enjoy a day filled with fun for the whole family! Visit with representatives from teams around Middle Tennessee and new for 2019, we will feature the Music City Blitz, a 5 on 5 flag football tournament that will help benefit Special Olympics Tennessee! Register your team at https://www.musiccityblitz.com. The SportsFest Speaker Series returns for 2019 with guests to be announced soon! Tickets are FREE for all ages. For full event info visit https://1045thezone.com/sportsfest.